Cruise on a catamaran and access the best spots! Board a catamaran and live an unforgettable experience in the Pacific warm waters. Kuare catamaran is the sailing sensation lovers’ boat par excellence. Her main skipper is also a dive instructor and an excellent kite-surfer and surfer. The South lagoon holds no secrets for him. Kuare sails cruises for surfers from May to September, and for kite surfers in summer. She is also perfectly adapted to peaceful discovery cruises where you enjoy relaxing on the islets as well as swimming and snorkelling. You can also board other catamarans to support your activities including diving. Contact the CHARTER operators now! 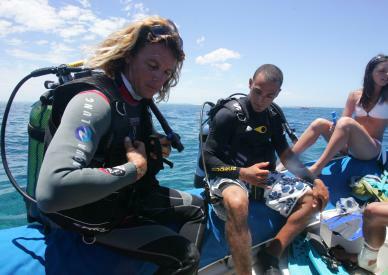 They will discuss with you itineraries and duration of your cruises, and teach you how to dive.